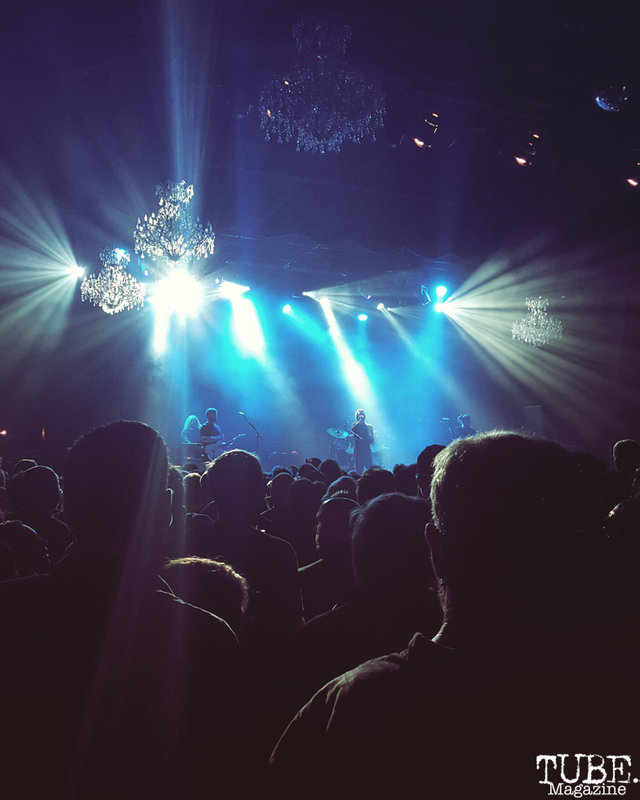 The ten chandeliers and one disco ball of the Fillmore in San Francsico have heard everything. They have heard every sound check, every note, every shouted conversation at the bar when someone tried to conceive how they can charge ten dollars for beer and four for water. Yet the choral swellings and perfect percussion of Danish rock band Mew were something different for these crystal danglings. 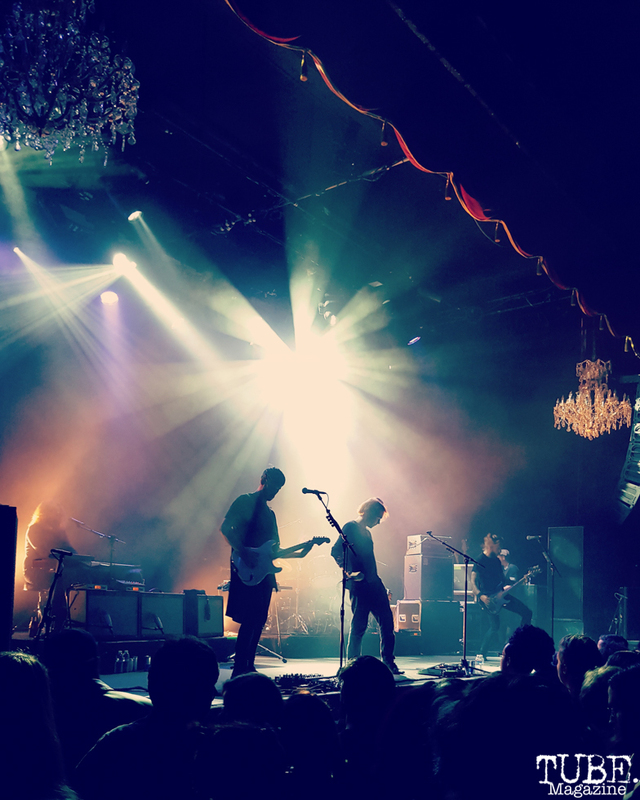 The band has not released an album since 2009, and has not toured the states in just as long, so their appearance at The Fillmore to push their new album +- was something like an eclipse, rare and exciting. 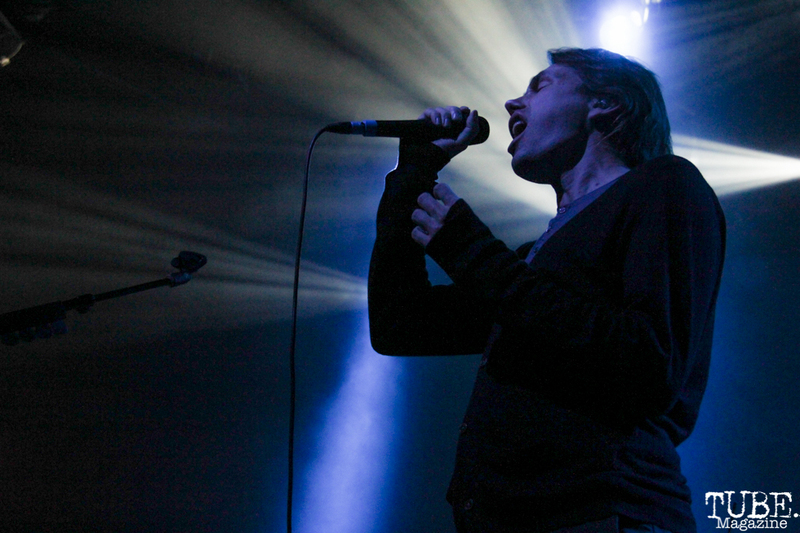 The main lineup consisted of lead vocalist Jonas Bjerre, bass player Johan Wohlert, and drummer Silas Jorgensen. The band once also contained guitarist Bo Madsen, but he left the band in July of this year. Wohlert took time off to care for his new child, but is now back with the band. Despite these changes, it was hard to tell there had been half a decade between touring. The performance was one of precision and passion. Once the lights dimmed, each of these men came on in reverse order. First, drums lit from below, then bass lit from above, and when Bjerre took the mic the full force of green and blue lights exploded on the stage sending the entire space into a frozen winter forest. These were the mental images that came up when listening to Mew: scenes of canals and fjords powdered with frost, while in the distance shone chrome towers. Beings with gossamer wings riding mysterious steeds. The songs on +- were things of synthesizers and chimes, acoustic guitar and throbbing bass. And beneath it all were Jorgensen’s drums, the powerful heartbeat of a prog rock album spliced into a cerebral and heartfelt winterland. The songs were transportive, and induced chills. However, at times the uplifting verses and harmonic choruses did seem a little schmaltzy. And true, some of the songs sounded like the music Tolkien’s elves would blast in their Teslas (they would absolutely drive Teslas) swerving down a coast road while they discussed the drama of immortals. Yet this is to be expected in a society choked with visions of doom and heartache. Genuine feeling often come off as fabricated, insincere. Though the listener might experience moments of cynicism, those should be discarded. Mew was not there to fool anyone. Mew is what would happen if Yes had a baby with Of Monsters and Men (though Mew is in fact older than Of Monsters And Men, having formed in 1994) and Boston was their drop-in stepdad. Bjerre’s falsetto rose into their new single “Satellites,” an ethereal yet pounding anthem containing phrases like “My life is my own/And now I’m always home/that’s where I spend my time.” The melancholy of the lyrics contrasted with the jangling guitar arpeggios and Jorgensen’s persistent timing. Wohlert, with his beautiful ponytail, danced around the entire stage like a man who won some secret treasure, seemingly oblivious to the aching longing of the words. This paradox is Mew’s dimension, they thrive here. The band also played “The Night Believer,” a journey through collapsing glacial cliffs. Lyrics like “Your hug becomes a straightjacket now/Shook-up about it/You bring the night-believer/The wrong key, always.” Sad and wistful words. Yet they were overlaid by victorious drums and quickly strummed guitar with the otherworldly keys played tunes from Faery. If another band had the same lyrics, it would be easy to imagine some minor scale with angry drums while the bass player tried to chop off their thumb. Somehow Mew found a way to make these scenes sound promising and beautiful. The band was also playful and grateful to the audience. Something like every other song, Bjerre took the time to thank everyone for coming out. Usually at shows the audience is lucky to get something like this once or twice, yet Mew made a point of thanking everyone repeatedly. Wohlert also told a story about his grandparents meeting while attending UC Berkeley, which got a chorus of woos from the crowd, before revealing his grandmother had recently passed. Condolences, awws, raised glasses and one or two outlier woos. There are always outlier woos. These interactions made the evening seem more like a gathering of kin, spirits joining again after travels in other voids. Audience and performers in a feedback loop of gratitude. 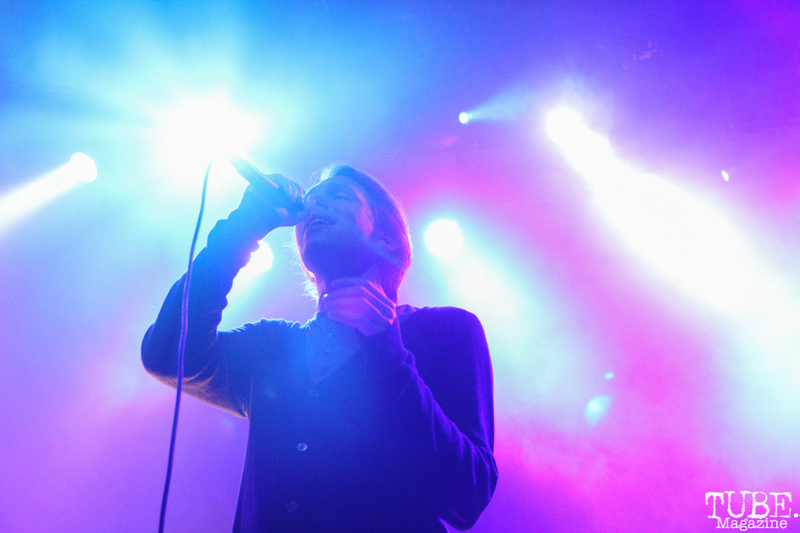 In interviews, Bjerre has described Mew’s sound simply as “hope.” Former guitarist Madsen has described it as “indie-stadium.” Both of these descriptions, after the Fillmore show, seemed only slightly hyperbolic. It was late on a Saturday and people were still tired from the week, dreading the visage of Monday which hangs always over Sunday mornings. Fatigue from the earlier show, so much standing. 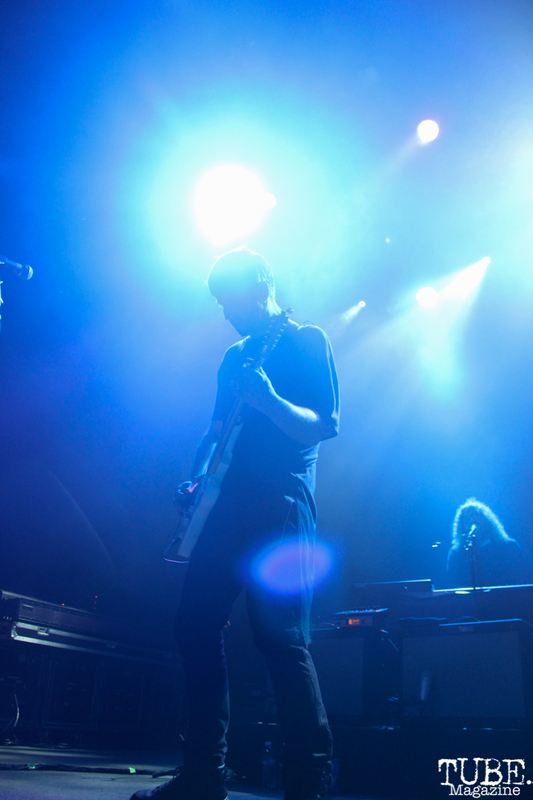 But due to the band’s attention to the crowd and genuine energy the mood quickly changed. Around two hundred strangers became old friends, joined by spider webs laced with dew drops and ten dollar beers. Tags: +-, Anouk Nexus, Bo Madsen, Boston, Danish rock, elves, Evan Nyarady, her, Johan Wohlert, Jonas Bjerre, Mew, mew concert, mew review, Mew tour, Of Monsters and Men, San Francisco, shows, Silas Jorgensen, Teslas, The Fillmore, Tolkien, tube magazine, tubemag, UC Berkeley, Yes. Bookmark the permalink. Previous post ← See: Ortbal’s Amazing Musical Chairs.